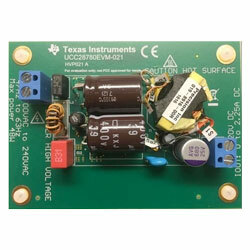 Texas Instruments UCC28780EVM-021 Converter EVM is for evaluating an off-line active-clamp flyback adapter for notebook charging and other applications. The evaluation module meets CoC Tier 2 and DoE Level 6 efficiency demands. This module is designed for evaluation purposes and is not meant to be an end product. The device converts input voltage of 90VRMS to 264VRMS down to 20VDC, with a 2.25A nominal output current rating and a 160ms limit for over-power capability. The main devices employed in this design are active clamp flyback controller UCC28780, SR controller UCC24612, and Si MOSFETs. The Adaptive Burst Mode feature maintains high efficiency even at light loads. The 45W, 20V AC/DC converter comprises active-clamp flyback controller, Si MOSFET Power IC, and synchronous rectification, offering high efficiency of >93%, high power density of >20W/in3, offers 55mW low standby power, and 300kHz high switching frequency. The device exceeds EU Code of Conduct and US Department of Energy efficiency demands.